For a young infatuated couple looking to tie the knot quickly and easily, planning a wedding in Vegas can be a fun, exciting, and memorable way to seal the bond of marriage. For those of us who love to gamble, it’s a great chance to tie in a wedding with a wonderful honeymoon location at the same time. Of course it’s not for everyone, but with seemingly endless possibilities for rapid, bizarre weddings, Las Vegas has plenty of options for those who are looking for a bit more excitement than an average ceremony in a church has to offer. This makes Las Vegas a haven for young couples who scoff at tradition. Las Vegas’ extremely lenient laws for marriage licensing are a large factor in this fairly unique phenomenon. In order to receive a legally bonding marriage license a couple really only needs a mere $55 in hand as well as one legal form of I.D – be it a driver’s license, passport, or birth certificate. What’s unique about Las Vegas’ lax standards for marriage licensing is that there is absolutely no waiting period to receive your certification, and there is no blood tests required either. Essentially as soon as you walk into the Marriage License Bureau in the Clark County Courthouse located on 200 South 3rd Street, you’re as good as married. The offices are conveniently located on the first floor of the building, making planning a wedding in Vegas much easier. With your marriage license in hand the sky is basically the limit when it comes to your actual ceremony for your wedding in Vegas. 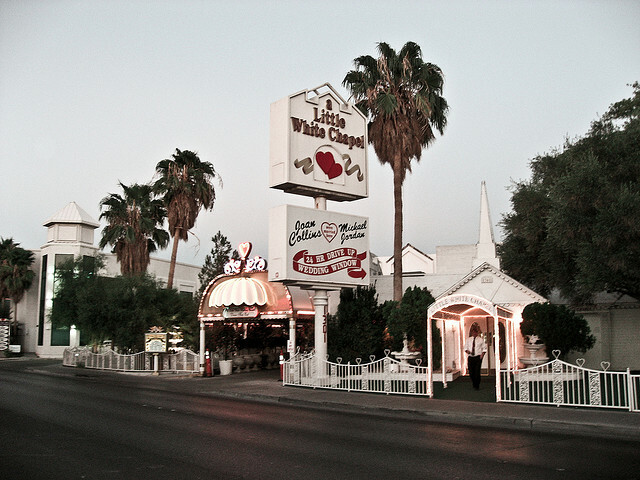 For those who are looking for a quick, easy service there are countless wedding chapels throughout Las Vegas, offering cheap packages, which on average are priced at around $75 for the cheapest options. With the most basic plan you show up at your chapel of choice, make your official vows with at least one witness in the crowd, have a few pictures taken by an in house photographer and you can be on your way with your new spouse all in about a half hour (if you desire a longer, more formal ceremony, perhaps this is not the best option for you). A couple can even get a drive-through wedding, never leaving the comfort of their car or limousine if they are truly committed to ease and speed in their marriage ceremony. More expensive and comprehensive options are readily available as well for those arranging a wedding in Vegas. Many large hotels have their own chapels for these reasons offering their own packages included with rooms for your guests, florists, photographers, and your own personal wedding planner to help you straighten out the finer details. Perhaps one of the largest draws for folks who are planning a wedding in Vegas is the vast amount of bizarre themed weddings. Always fancied yourself as a pirate? You can have a ceremony dressed in full pirate regalia aboard a full size replica of a pirate ship. Are Harley Davidsons more your cup of tea? You can just as easily ride down the isle and offer your wedding vows from the back of a bike, decked head to toe in leather. For the creative couple, Vegas has an almost endless amount of options to provide you with an extremely memorable wedding ceremony. If you are searching for an exciting, quick, or even off-kilter wedding, look no further than Las Vegas. Planning a wedding in Vegas is certainly something you’ll remember for the rest of your life. Why Choose the Bellagio in Vegas?